Shri Maan Mandir temple is located at hilltop of the Maan Garh mountain near Maanpur village. Maanpur is located in the suburb of Barsana village. Barsana village is located at the Nandgaon-Govardhan road. 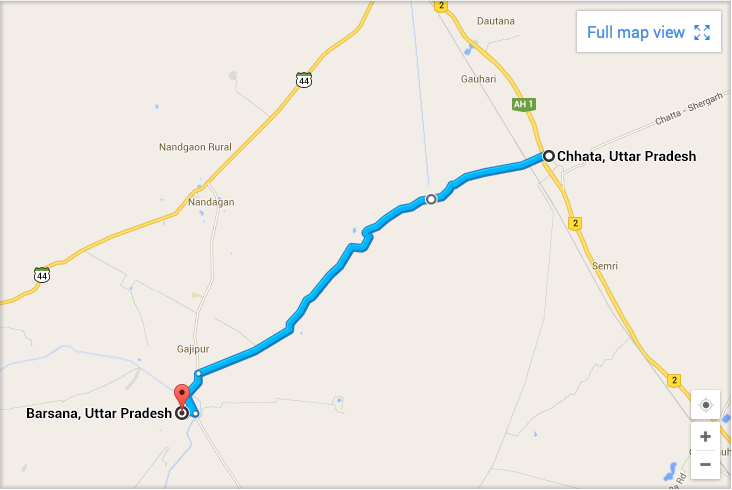 A very famous interstate Delhi-Agra highway goes through Braj region and connects Braj with Indian highway system. If you are coming from Delhi, you have two options to reach Barsana. From Kosi Kalan, you can take Govardhan road that goes through Nandgaon and connects to Barsana village. Barsana is 18 KMs from Kosi. Another option is to take Chhata Barsana road. Chhata comes around 10 Kms farther from Kosi Kalan if you are driving from Delhi. From Chhata, there is a road that meets directly to Barsana village. You have to pick either of the options if you are coming from Agra. Once you reach at Mathura Station, you can take any of the local transportation options such as Tempo or Jeep service or you can hire your own taxi to reach Barsana. Once you reach Barsana, all you need to do is follow the signs to Maan Mandir Seva Sansthan to reach to the temple. If you need any help, please contact us at here. If you have only one day to spend at the temple, you can best utilize it by reach at the temple early in the morning before the Morning Lecture (Prabhat Satsang) around 8 AM and leave after the Raasotsav (Nritya Upaasana) around 7:30 PM. This way you will get to see both satsangs by Shri Ramesh Baba Ji Maharaj. If you cannot spend that much time at the temple, we encourage you to either come early in the morning before 8 AM for the Morning lecture or come in the evening before 6 PM so that you can attend Raasotsav Nritya Upaasana. If you have enough time to spend at least a night, you should come around 5 PM in the evening a night before and leave after the Morning Lecture of the next day around 10 AM. This way you will get to see both the main events by Shri Baba Ji Maharaj. If you are planning to spend more than 2 days, you will have opportunity not only to visit various places of Leela Sthalies in and around Barsana but you will also have ample amount of opportunities to see how one of the biggest goshalas in India, Mataji Goshala, is maintained and operated. It is really a fun. There are a number services that anyone can do without any prior experiences. Similarly, there are a number of opportunities in various other activities such as Daily Prasad Seva, Bhiksha Utsav etc that give you enriching experience of bing in the proximity of Braj Dham.